You may know of corporations, institutions, funding agencies and individual donors willing to help sustain the work of Classic Soul Radio.org. You might even know a friend willing to donate to our efforts. Please refer them to our home page. Helping us spread the word about ClassicSoulRadio.Org is a huge help. If you have friends that you think might enjoy ClassicSoulRadio.Org – please take a moment to drop them a note. You can do that by sending them an email and simply ask them to check out ClassicSoulRadio.Org. It doesn’t matter if they live in your town, in another state, or in another country half-way around the world since Internet streaming audio makes it possible for people anywhere on the planet to tune in. Remember, contributions made to Classic Soul Radio, Inc., a tax-exempt organization under Section 501(c)(3) of the Internal Revenue Code, are deductible for computing income and estate taxes. 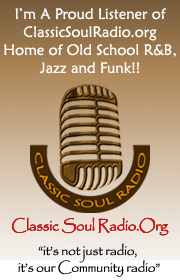 Classic Soul Radio Graphics: Buttons, Banners, and Links! The Classic Soul Radio logos on this page are for use in the promotion of the Classic Soul Radio.org branding and/or for use on web pages, blogs, forums, home pages or web sites that link to Classic Soul Radio. Please follow the guidelines below to ensure that the Classic Soul Radio branding is maintained and correctly represented. E-mail us at widgets@classicsoulradio.org to let us know that the Classic Soul Radio widget has been placed on your site, or if you have any problems or questions. Thank you! Please do not alter the images or distort them in any way. When using our logos or Widgets at a different size than the one shown, please keep the proportions the same. Do not tile the image in the background or make the logo or Widget part of a pattern. When placing the Widget or logo on your page, please link to the address shown in the html code underneath each Widget or logo. To cut and paste the codes provided below onto your pages, highlight the code and press CTRL + C and then CTRL + V on a PC. If you are on a Mac computer, highlight the code and press APPLE + C and then APPLE + V; and then change the image path to the path where you saved the Widget or logo. Place these recommended Classic Soul Radio widgets on all your social networking sites, web pages, blogs, forums, or home pages and lend your support to Classic Soul Radio. USAGE: On web and blog pages. 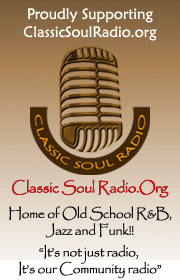 To place this logo on your site and link to Classic Soul Radio, CUT and PASTE the code below into your web page. 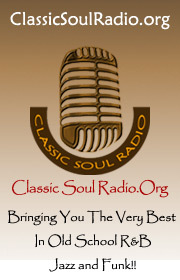 Share Classic Soul Radio with all your friends, family members, and colleagues. One of the best ways to help spread the Classic Soul Radio is through your social Networking sites. Like Classic Soul Radio on Facebook! Recommend Classic Soul Radio to everyone you know, including all your family members, friends and colleagues! Follow Classic Soul Radio on Twitter! Watch Classic Soul videos on YouTube! Watch your favorite Classic Soul videos on our YouTube Channel. Upload your favorite Classic Soul videos onto YouTube and tag them Classic Soul Radio. Postings about ClassicSoulRadio.Org on appropriate web forums are also a great way to help spread the word. When you run across an appropriate place to mention ClassicSoulRadio.Org – such as music forums that are about music or radio, websites for artists that are played on ClassicSoulRadio.Org, or other appropriate locations – don’t be shy about letting people know about ClassicSoulRadio.Org. Be sure to include our web address in your post. NOTE: It is very important not to spam ClassicSoulRadio.Org on forums, blogs, personal music sites, or post on non-music-related sites or site areas. Doing so will reflect poorly on us.